FootGolf combines the popular sports of soccer and golf. To play FootGolf, athletes use regulation size #5 soccer balls on a traditional golf course with 21-inch diameter cups. FootGolf is played on a regulation 18 hole golf course. The pace of play standard round for FootGolf is 2 hours. "Kick Times" may be booked day of, based on availability. Desert Willow Golf Resort does not take advanced bookings for FootGolf, we apologize for any inconvenience. "Kick Times" for FootGolf are limited, based on availability and golf traffic. FootGolf tee times must always be booked over the phone, day of, by calling (760) 346-7060 Ext. 1 or in the Golf Shop. The sport is played in the traditional format of up to four players per group with FootGolfers using golf carts. FootGolf uses golf's basic model including tee boxes, greens, bunkers, hazards and 18 holes of play. Scorecards display par scores for each hole as in regular golf. FootGolf as a game is played throughout the world in many different forms, but as a sport, it is regulated by the Federation for International FootGolf (FIFG). The American FootGolf League (AFGL) is the exclusive member of the FIFG and governing body for the sport of FootGolf in the United States. *Golf cart included. Guest must have a valid driver's license. PLEASE NOTE: FOOTGOLF WILL BE UNAVAILABLE FROM SEPTEMBER 1ST, 2019 - NOVEMBER 1, 2019 DUE TO OVERSEEDING ON MOUNTAIN VIEW!!! "Kick" times for FootGolf are limited, based on availability and golf traffic. Rate includes up to 18 holes of FootGolf. FootGolf "kick" times must always be booked over the phone by calling the golf shop direct at (760) 346-7060 Ext. 1 (not available online). "Kick Times" may be booked day of, based on availability. Desert Willow Golf Resort does not take advanced bookings for FootGolf, we apologize for any inconvenience. FootGolf "kick" times are available after 3:00 pm, based on availability. FootGolf balls are availabe for purchase in the golf shop starting at $15.00 per ball. 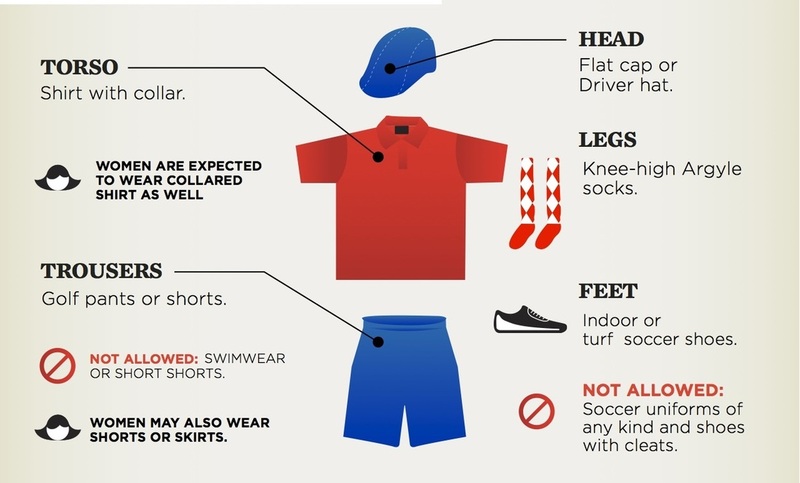 Wear appropriate clothing - golf cap, collared shirt, and argyle socks are preferred. Kick off your ball from a position behind the tee markers. Play the ball from where it lies: You are not allowed to move the ball or remove jammed objects. Exception: You may mark the spot and lift the ball when it may obstruct the other player's kick or ball in any way. The order of play is established based on the score or the previous hole. The player with the best score will kick off first on the next hole followed by the second, etc. If the ball lands in a water hazard, retrieve or replace it within 2 steps from the closest land point from where the ball entered the hazard (annotated by red line), receiving a one stroke penalty or you can place the ball at the position of the previous kick and receive a one stroke penalty. Indoor soccer shoes, turf soccer shoes, sneakers, or golf shoes are recommended (NO SOCCER CLEATS). Regulation size #5 soccer ball for adults. Children age 12 and under must be accompanied by an adult (at least 25 years of age). FootGolf is a game that combines the game of soccer and the game of golf. 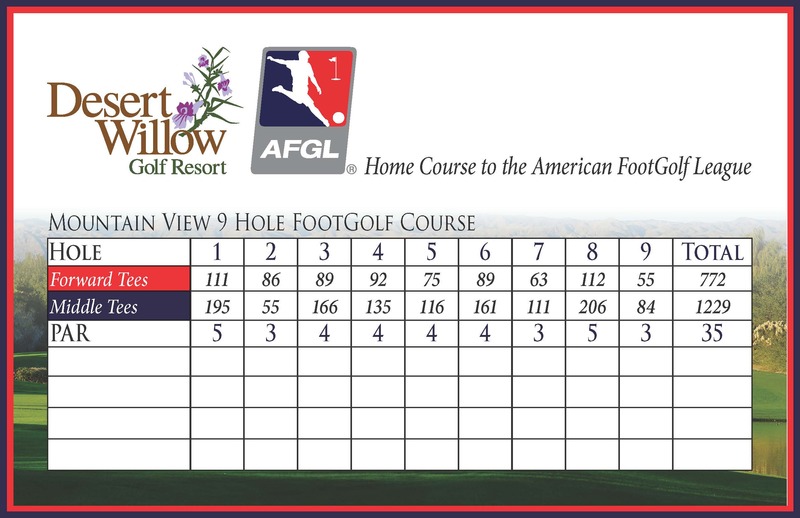 Why is Desert Willow Golf Resort offering FootGolf and partnering with the American FootGolf League (AFGL)? Desert Willow Golf Resort is offering the FootGolf experience as a way to introduce new customers to Desert Willow Golf Resort and the community. By partnering with the AFGL we can reach more people that are already FootGolf enthusiats, we can attract local, regional, and national sanctioned events. In addition as the game continues to grow the AFGL will garner more national attention through media coverage, press, and special events hosted on site. The FootGolf experience at Desert Willow Golf Resort will offer another healthy outdoor activity to local and visitors of the Coachella Valley. Is FootGolf a fad or an activity that will be around for good? With nearly 500 courses in the United States already, a number expected to double over the next 18 months, the future seems very bright for FootGolf. Statistics show there are over 265 million soccer players worldwide. FootGolf is also attracting people that have never played golf, new customers that otherwise may never visit the local golf course. The American FootGolf League is the United States governing body of FootGolf similar to the USGA or Royal and Ancient with golf. What equipment is needed to play? FootGolf is played at a golf course with a size 5 soccer ball and a spike-less turf shoe or tennis shoe. Yes. FootGolf offers a variety of teeing options based on skill level, age, and handicap so that anyone can play the game of FootGolf. How long does it take to play a round of FootGolf "Foursome"? With a golf cart it takes approximately 1.5 - 2 hours, by foot 1.5 - 3 hours. Can FootGolf and Golf be played along with golfers playing FootGolf? Although some facilities do offer similar programming, Desert Willow Golf Resort will attempt to keep both activities separate and not comingle the two. Are golf carts required to play FootGolf? Desert Willow Golf Resort will offer the option on certain FootGolf programs to walk or ride. Will there be FootGolf programing available year round? Desert Willow Golf Resort will be offering FootGolf playing opportunities all year with the exception of over-seeding, and aerification. What is the yardage of the FootGolf course? Typical yardages are approximately 50% of a similar par golf hole. Does the FootGolf course have any negative impact on the actual golf course? One of the most beneficial aspects of the FootGolf course is there is no interference or alteration to the golf course. The FootGolf course will share some teeing areas and the green complexes are located in rough areas or inconspicuously located out of the golfer's area of play. Desert Willow Golf Resort will operate the FootGolf programming without giving up tee time inventory. Space and time that could not be used for golf programs will now yield additional revenues for the resort. 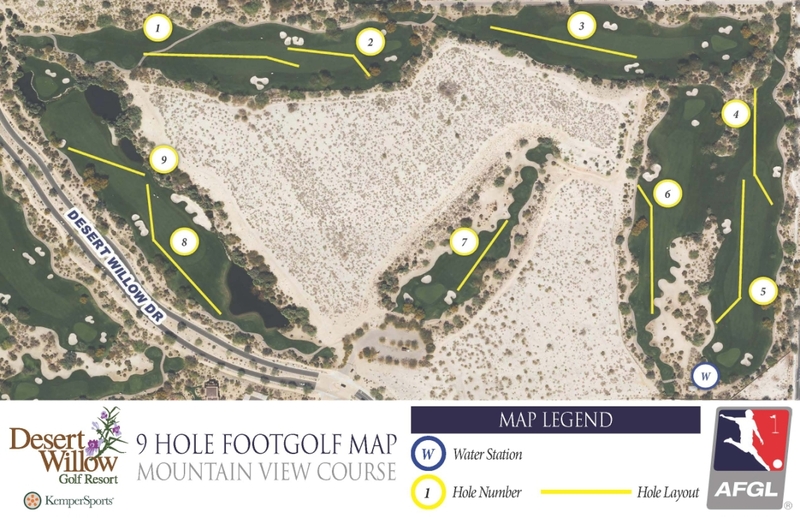 Desert Willow Golf Resort is a Certified FootGolf Course of the American FootGolf League (AFGL) that promotes the sport of FootGolf under the rules and guidelines of the Federation of International FootGolf (FIFG).